One might think I have nothing better to do but sit around and chat… Who knows me well, knows I really enjoy doing just that–chat, chat, chat. And if you give me a cup of coffee with a TON of milk, you’ll never get rid of me. I’m today over @ Writers and Authors talking with Lindsell about my desire to write, favorites authors and much more. Went over and read your interview. As always, I love the peek into your past. I adore the cartoon you posted on this page. 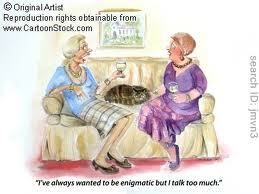 No wonder I can’t be enigmatic!